Hardly anybody will dispute that a piano looks massive and bulky. Nevertheless, in reality, it is one of the most sophisticated of musical instruments, exquisitely pieced together from delicate and complex parts that work in perfect harmony, making each of the 88 keys produce a distinct note. The piano keys together with the internal components are subject to routine wear and tear not only because of extensive use but also due to weather or climatic variations. Piano tuning is therefore imperative if you wish to keep the playing the instrument for long. Periodic maintenance and care of your piano are the least you can do for owning this grand musical instrument. The average piano tuning price usually varies from $65-$230 but the figure could go easily go up if you have to go in for multiple fine-tunings within a specific time period, say a year. 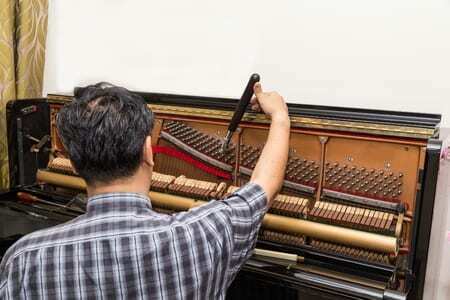 Always hire an experienced professional instead of going DIY as piano tuning requires one to possess extraordinary skills which can be honed only through meticulous training and practice. In order to adjust or tune the piano to uniform pitch, the technician fine-tunes the tension of each and every string. The technician (and even the pianist) will know instinctively that his piano tuning was effective once the strings start throbbing exactly as they did when the instrument was in shape. The standardized piano tuning technique is “A440” which denotes that the note ‘A’ lying over middle ‘C’ pulsates at the rate of 440 cycles for every second. Since every string that is connected to a particular key throb at a particular frequency, tuning the instrument boils down to simple mathematics. The technician knows that the ‘A’ note following “A440” throbs at 880Hz per second and the note preceding “A440” beats at 220HZ every second. Pianists generally take advantage of the standard tuning strategy so that they are able to synchronize their performance with other musical instruments. Both professional and amateur pianists are aware of the need to go in for piano tuning once in a while so that the keys generate notes with the perfect pitch. If you tune the instrument on a periodic basis, the natural tension in all the strings is prevented from becoming excessively slackened which could result in keys producing notes that are ‘out of tune’. Timely tunings also enable the piano technician to conveniently check for any sign or signs of damage incumbent upon the soundboard. A majority of the piano manufacturers are of the opinion that you should go for piano tuning at least a couple of times in a single year. Nevertheless, there could be occasions when you might have to opt for more or extra tunings. Pianos which are brand new or about 3-4 months old require 3-4 tunings every year in the beginning in order to allow the strings the opportunity to stretch and retain their normal tension. On the other hand, pianos which are played extensively, like those in schools, churches, choirs, music studios, and philharmonic orchestras need to be tuned more often. The reason for the extra tunings or adjustments is that frequent sessions impact the tension of the strings. Normally, pianos which are used professionally are tuned every time before a performance. Sometimes, the piano could be unevenly tuned which happens because the owner didn’t tune the instrument for a long time. The piano’s soundboard goes through inordinate expansion and contraction. The technician while tuning has to see to it that the notes generated at every octave correspond. Previous Previous post: How music can add a spark of positivity in every sphere of your life? Next Next post: Why Should You Tune Your Piano More Often?